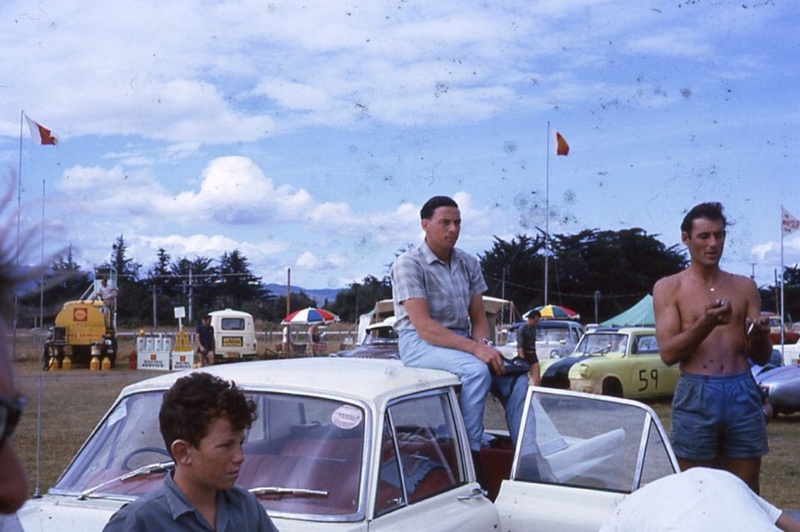 Jim Clark takes in a few rays and a touring car race from his grandstand atop a Ford Zodiac, Levin, New Zealand Tasman, January 1965. 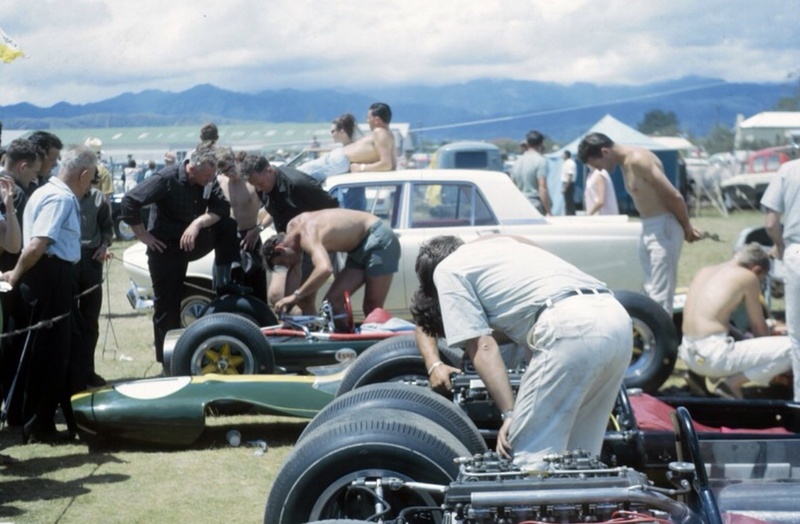 In the distance are the Tararua Ranges, alongside the Team Lotus mechanics are fettling Jim’s Lotus 32B Climax. The champions relaxed nature and the scene itself epitomises all that was great about the Tasman Series. We had the best drivers on the planet visit us every summer and whilst the racing was ‘take no prisoners’ the atmosphere off track was relaxed- the parties, water skiing, golf and annual cricket matches at the Amon family beachhouse are stories told many times over. 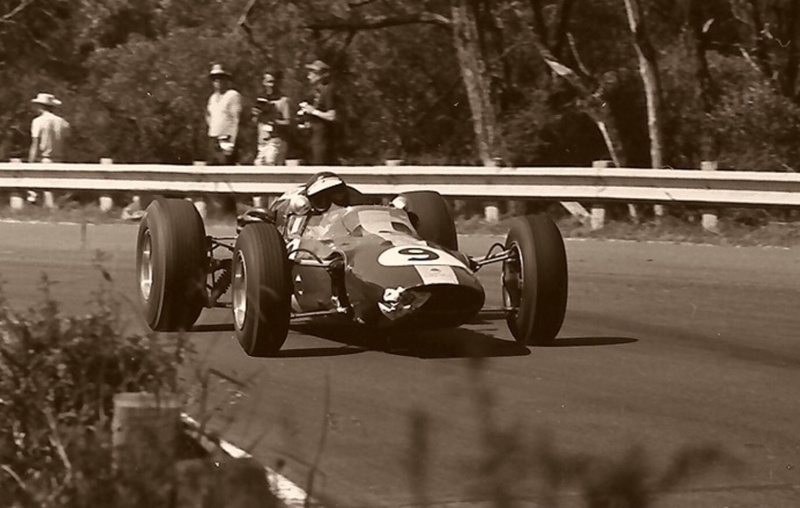 Few racing drivers have had a season like Jim Clark did in 1965, surely? 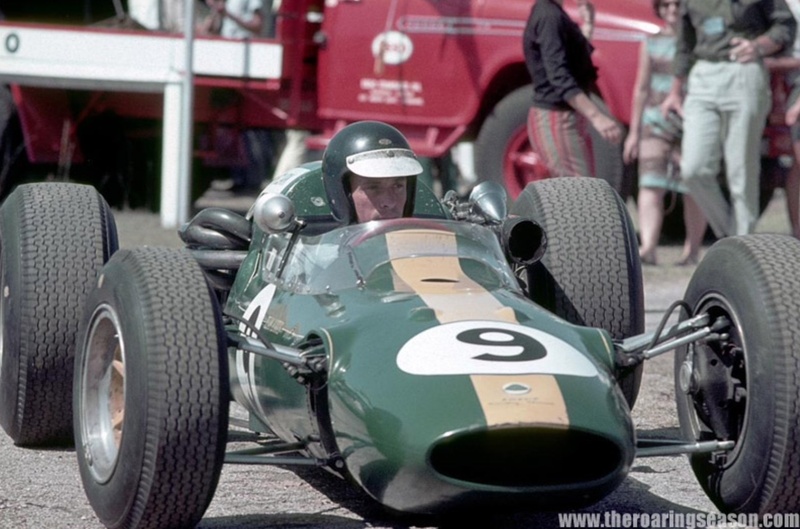 He started the year in Australasia and took the Tasman series with four wins in a Lotus 32B Climax FPF, won the F1 Drivers Championship in a Lotus 33 Climax with 6 wins and topped it all off with victory at Indy aboard a Lotus 38 Ford. In between times he contested the usual sprinkling of F2 events and some Touring Car races in a Lotus Cortina. Lets not forget a few longer sportscar races in the Lotus 40 Ford Group 7 car in the US. Not to mention other races as well. Amazing really. We were lucky enough to have the immensely likable Scot in the Southern Hemisphere at the seasons commencement though. 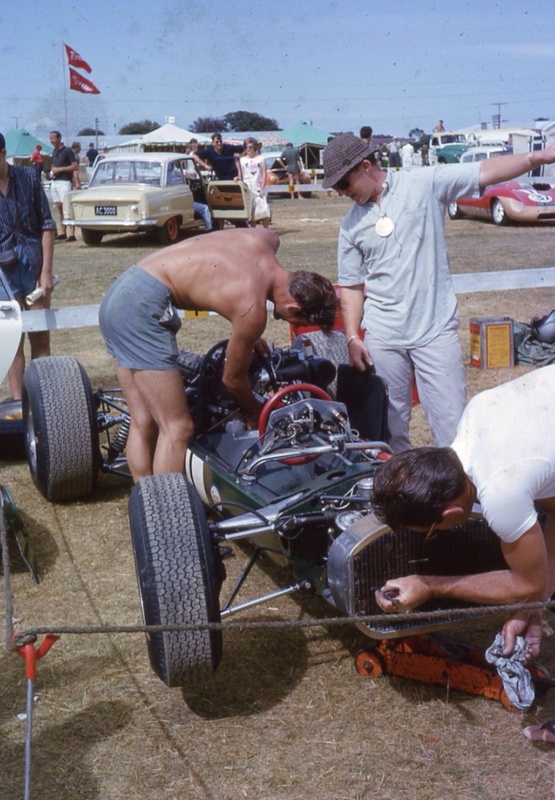 Colin Chapman had the Lotus Components lads build up a Tasman Special for Clark which was a mix of an F2 Lotus 32 chassis, 2.5 litre Coventry Climax 4 cylinder FPF engine and ZF gearbox. The combination was very successful taking race wins at Wigram, Teretonga, Warwick Farm and here at Levin on 16 January 1965. Twelve Lotus 32 chassis were built plus Clark’s Tasman one-off car which was built around chassis or tub number 32/7. Unlike the 1 litre Cosworth SCA powered F2’s which used a full-monocoque chassis the 32B used a monocoque front section with the rear section removed and replaced by a tubular steel subframe to which the 235bhp, 2495cc, 4 cylinder Coventry Climax FPF engine was mounted. Otherwise the cars suspension, inboard at the front by top rocker and lower wishbone and outboard at the rear was the same as the F2 32. 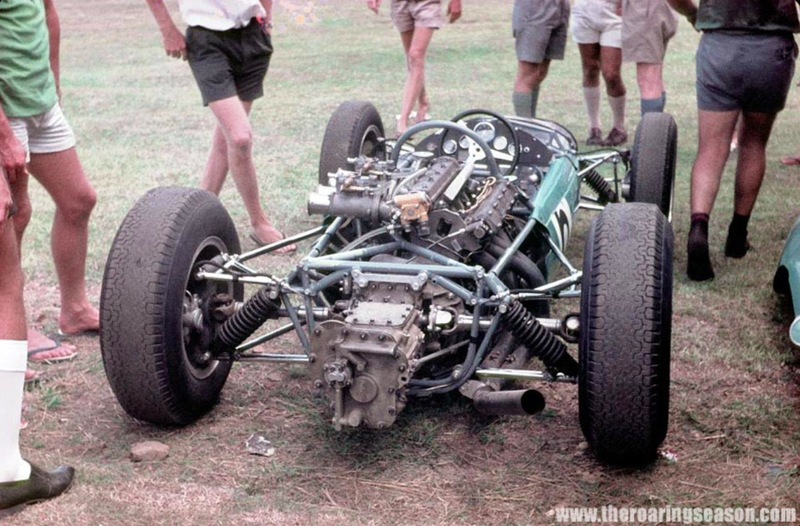 The gearbox was a ZF rather than the Hewland Mk6 of the F2 car. The car chassis plate was tagged ’32-FL-8′ where ‘FL’ was Formula Libre. This car still exists and is owned and raced by Classic Team Lotus, a shame really as its entire racing history was in Australasia. 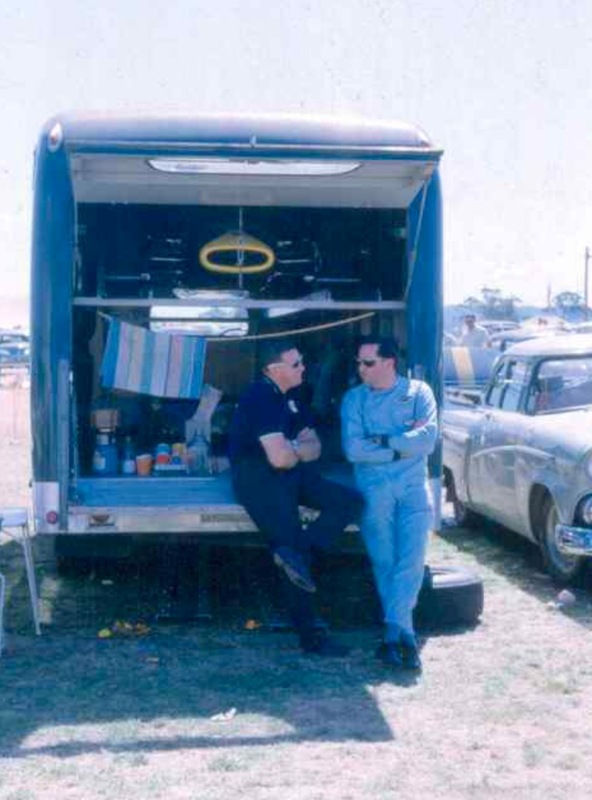 Clark won the Tasman in it, the car was then bought by the Palmer family, Jim raced it to NZ Gold Star victory and very competitively in the ’66 Tasman before selling it to Australian Greg Cusack. 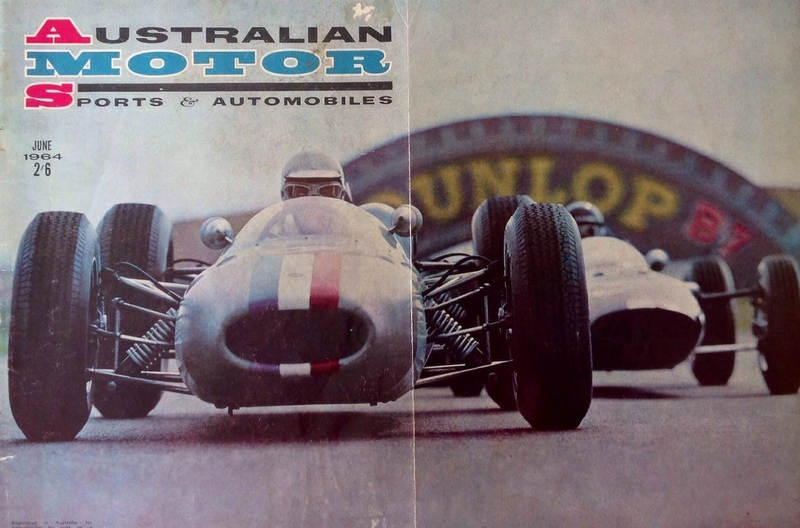 The car was also raced by South Australian Mel McEwin in period, albeit it was becoming uncompetitive amongst the multi-cylinder Repco’s and the like by then. Eventually it passed into the very best of Lotus hands- the late John Dawson-Damer acquired it and restored it, eventually doing a part exchange with CTL to allow them to have a Clark Tasman car in their collection. John received a Lotus 79 Ford DFV as part of the deal, he already had Clark’s ’66 Tasman car in his wonderful collection, the Lotus 39 Climax, so it was a good mutual exchange. 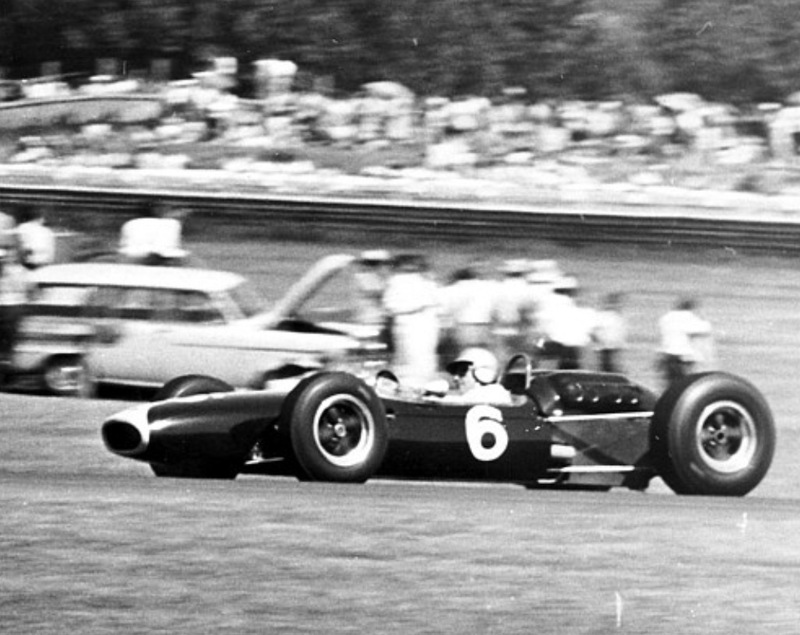 Clark won the ’65 Tasman title 9 points clear of 1964 champion Bruce McLaren aboard his self constructed Cooper T79 Climax and Jack Brabham’s BT11A Climax. Given the speed of the BT11A, it was a pity Jack contested only the three Australian Tasman rounds. Frank Gardner also BT11A mounted and Phil Hill were equal fourth with Phil aboard McLarens updated ’64 Tasman car, a Cooper T70 Climax. Graham Hill was 7th in David McKay’s Brabham BT11A Climax with other strong contenders Frank Matich Brabham BT7A Climax, Kiwi Jim Palmer similarly mounted, Bib Stillwell in a BT11A, Lex Davison in a BT4 Brabham. In addition there were a host of 1.5 litre Lotus Ford twin-cam powered cars snapping at the heels of the 2.5 FPF’s and set to pounce as the bigger cars failed. 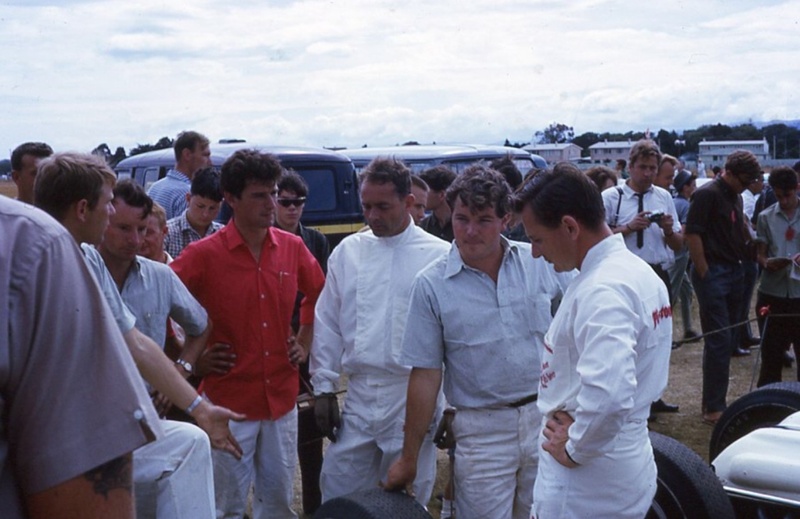 In this article I focus on one round, the Levin event held on 14-16 January 1965. Kiwi enthusiast Milan Fistonic took some marvellous photos at the event which are posted on Steve Holmes ‘The Roaring Season’ website, check it out if you have not, it’s a favourite of mine. They are paddock shots which ooze atmosphere- Milan focuses mainly on local boy Bruce McLaren and Clark, they are magic shots which I hope you enjoy. This account of the weekend draws heavily on the sergent.com race report. It is another ripper site I always use as my Kiwi reference source. 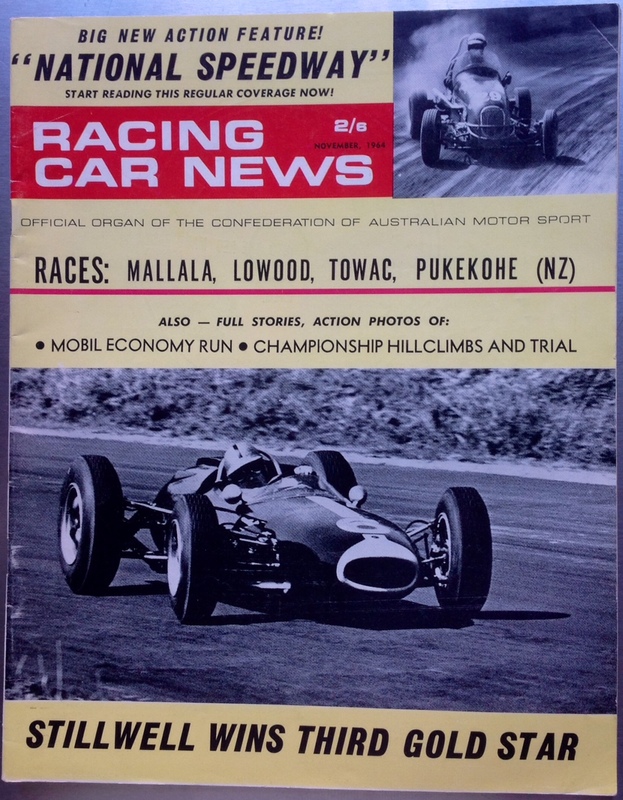 The 1965 Tasman series commenced the week before Levin with the New Zealand Grand Prix at Pukekohe. Graham Hill took a great win in David McKay’s new BT11A, straight out of the box, from the equally new Alec Mildren BT11A driven by Frank Gardner and Jim Palmer’s year old BT7A. 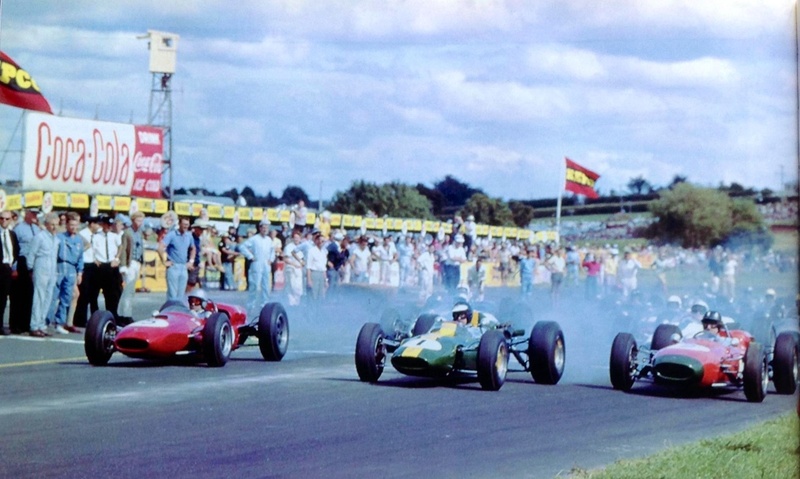 How about that, Brabham Intercontinental cars from first to third places, with Jack not driving any of them! 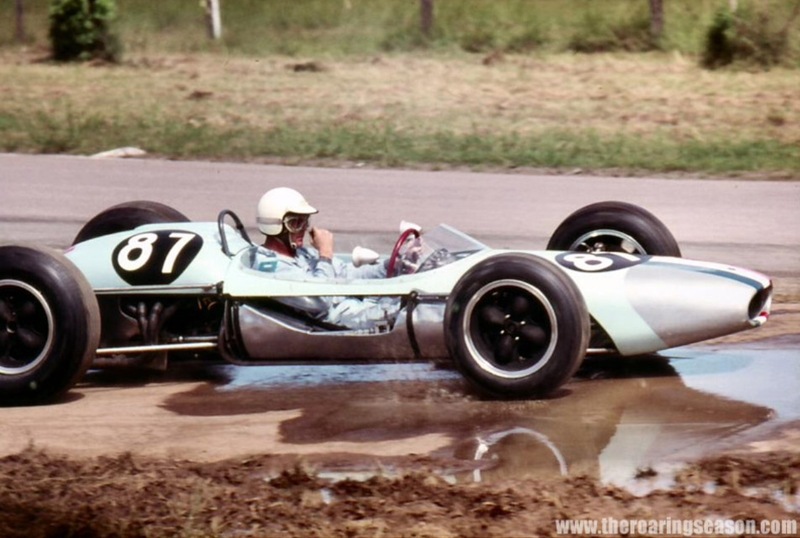 Ron Tauranac’s first in a series of three very successful Coventry Climax engined cars, Tauranac tagged them as ‘IC’ for ‘Intercontinental’, was the 1962 BT4, based on that years BT3 F1 FWMV Coventry Climax 1.5 litre V8 engined car. 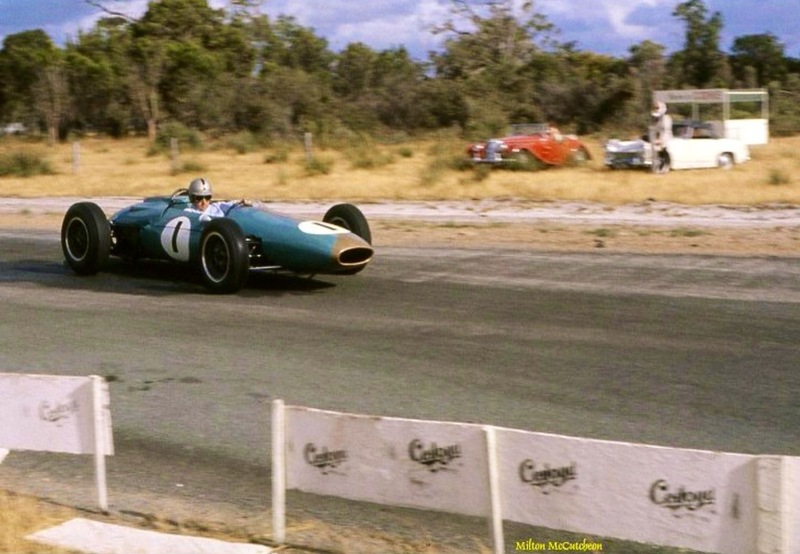 Jack raced the first of these in the 1962 Australian Grand Prix at Caversham, Western Australia, having a great dice with Bruce McLaren’s Cooper T62 until a back-marker took him out late in the race. This was followed by the 1964 BT7A and the 1965 BT11A. 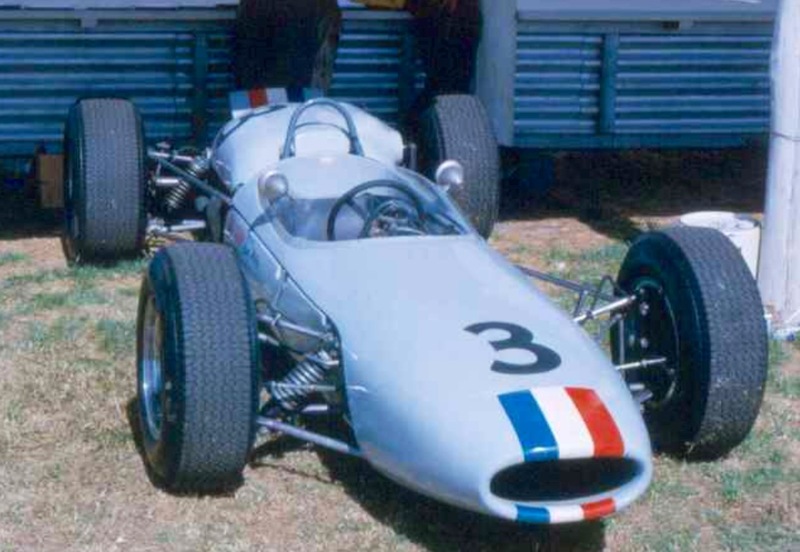 The BT11A’s were phenomenally successful in both Australasia and South Africa, winning lots of races and championships not least the 1966/7 Australian Gold Star Championship for Spencer Martin in the very same chassis raced by Graham Hill to victory at Pukekohe. The cars were utterly conventional, simple and oh-so-fast spaceframe chassis cars with outboard wishbone suspension out the front and outboard multi-link at the rear- single top link, inverted lower wishbone, twin radius rods and coil springs with Armstrong shocks. Like all customer Brabhams they went like the clappers straight out of the box as the base suspension setup was done on circuit by Jack’s ‘highly tuned arse’. 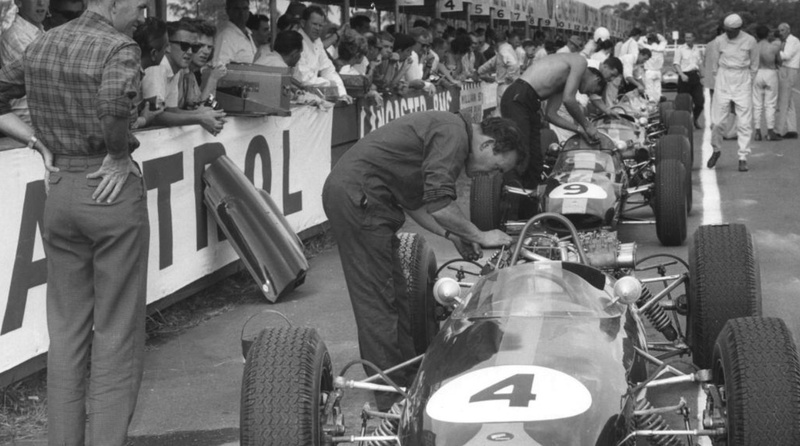 Many championships were won by Brabham customers not straying too far from factory suspension settings! 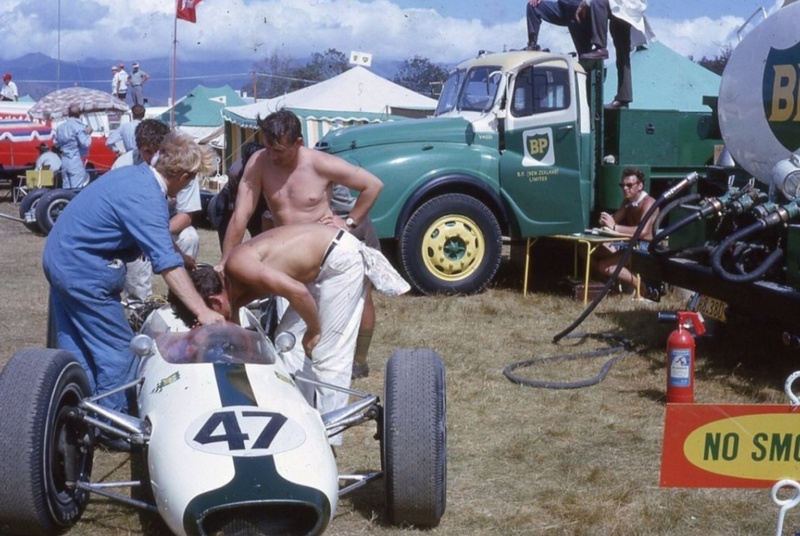 After the NZ GP the Tasman circus upped sticks from Pukekohe and drove the 500 km from the North of New Zealand’s North Island to its South, not too far from Wellington. Levin is now a town of about 20,000 people, then it would have been less than half that, and services the local rural and light manufacturing sectors. 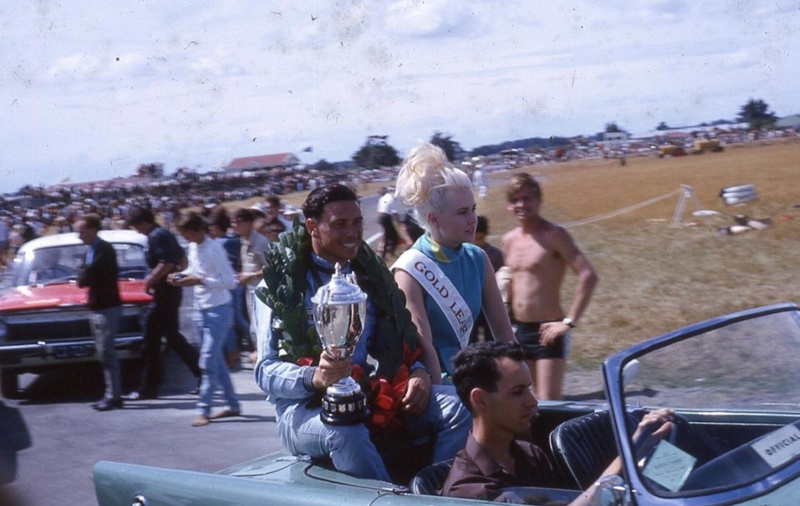 Jim Clark quickly got dialled in to his new Lotus 32B and down to business, opening his Tasman account by winning the Levin Motor Racing Club’s 30.8-mile ‘Gold Leaf International Trophy’ at fractionally more than 76.6 mph. The Flying Scotsman cut out the twenty-eight laps in fine style in 24 min. 5.9 sec and put in his seventh lap in 49.9 sec. 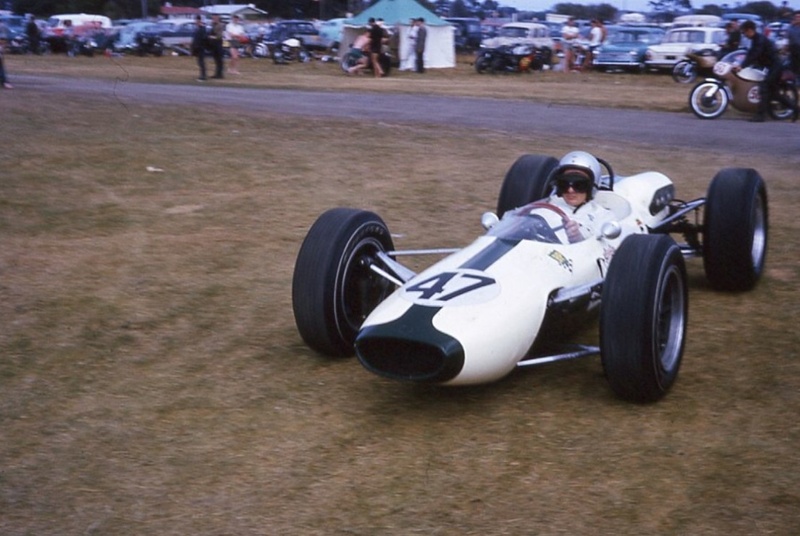 In 1964 Denny Hulme (2.5 Brabham-Climax) had set records of 24 min 36.8 sec and 50.3 sec in this event. 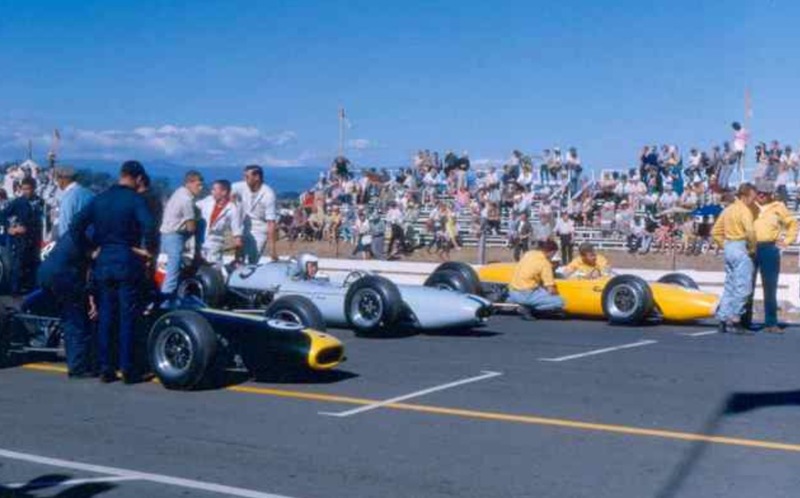 Repeating their NZGP form, Brabham-Climax conductors Frank Gardner and Jim Palmer, filled second and third spots, while next in line were the Bruce McLaren Motor Racing Team 2.5 Cooper-Climaxes of Phil Hill, T70 and McLaren, T79. 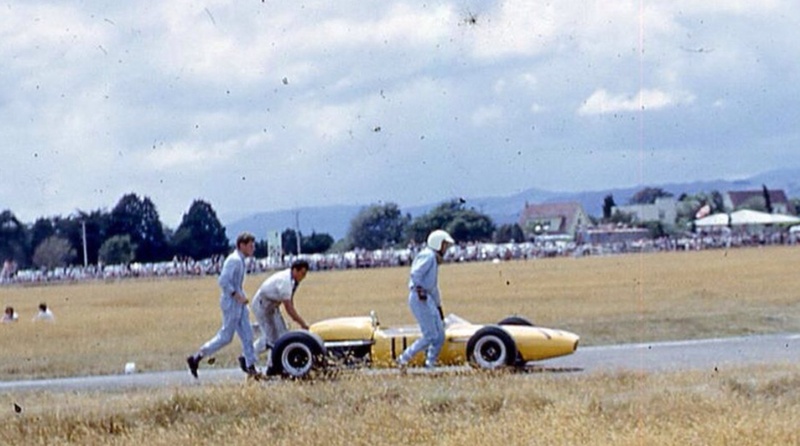 Graham Hill, Lex Davison and Arnold Glass shipped their cars to Australia after the NZ Grand Prix. 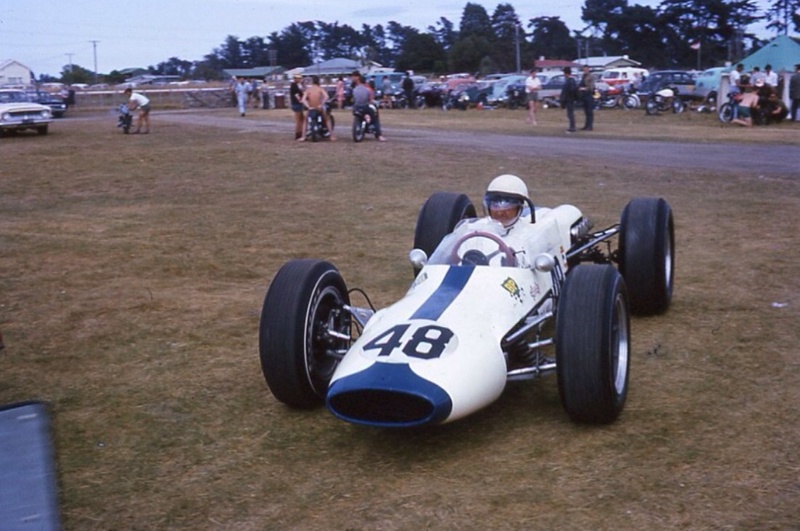 Wanganui driver, and later multiple Kiwi Champion, 1970 Tasman Champion and winner of many Asian Grands Prix, Graeme Lawrence had at last got hold of his Brabham BT6 which was making its first appearance at Levin. 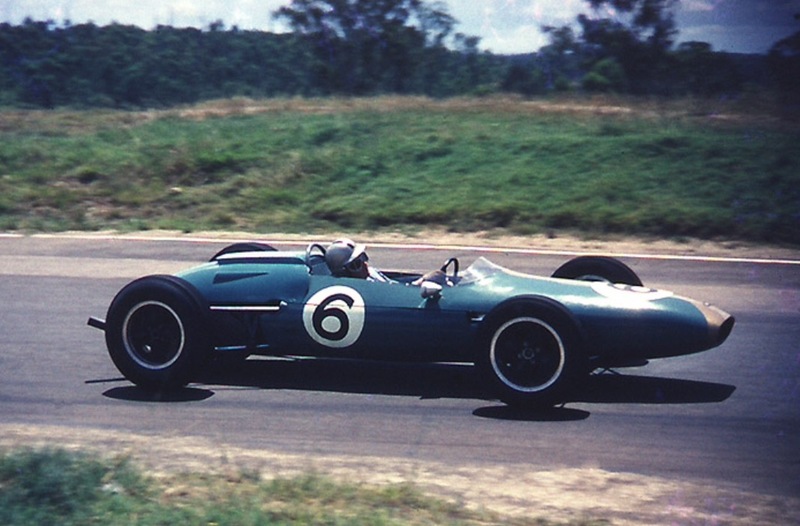 As noted above Brabham was having a Christmas break and did not join the series until the first Australian round at Sydney’s Warwick Farm in mid-February. Levin is a tight, twisty and bumpy circuit. Newcomers Clark and Hill quickly had the 1.1-mile track sorted. 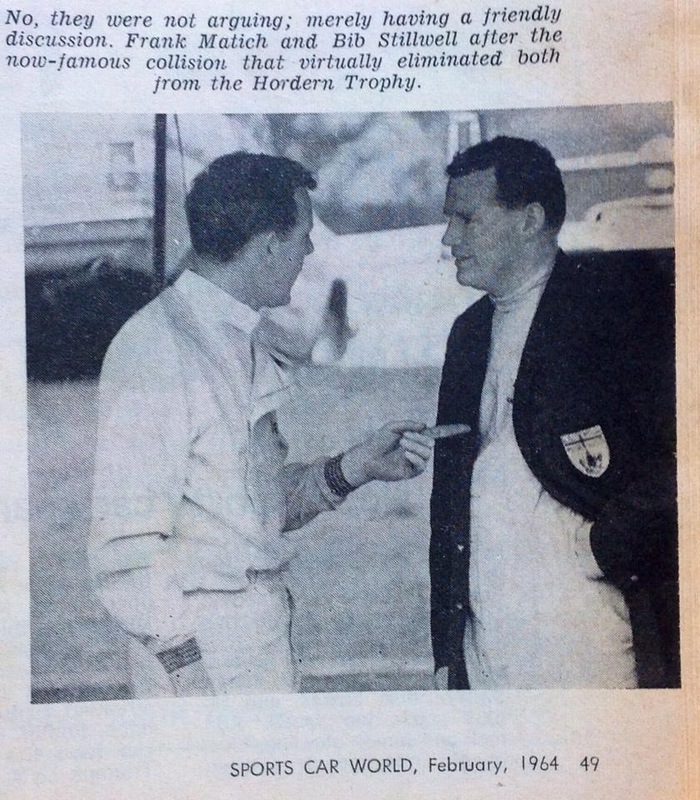 Clark’s qualifying lap was a 49.4 whilst Phil Hill managed 50 sec, the same time as his team leader McLaren. Bruce had a bitter-sweet 1964 Tasman Series. He won the championship in one of two Cooper T70’s he and his Kiwi mechanic Wally Willmott built at the Cooper Surbiton works. These cars, raced by Bruce McLaren Motor Racing, are generally acknowledged as the first McLarens, built as they were in a corner of the Cooper factory to McLaren’s design. The second car was raced by American ‘coming man’ Tim Mayer with great speed and skill until he made a mistake on the daunting, fast, unforgiving Longford road circuit in Tasmania which took the young drivers life. The undamaged T70 was updated during the winter to be raced by 1961 F1 World Champion Phil Hill with Bruce racing a new chassis, an evolved T70 designated T79, a spaceframe chassis was again used. The main difference between the cars were inboard front suspension on the T79 whereas the older T70 was outboard. The T79 used a nice, reliable but then new Hewland gearbox whereas the T70’s used a Colotti in one chassis and a Cooper/Citroen CS5 in the other. I wrote an article about Tim Mayer a while back, read it by following the link at the bottom of the page for details of the T70 design rather than repeat it all again here. Hill P had a terrific Tasman which was a tonic for him as his single-seater career had stalled somewhat since his F1 title winning year. 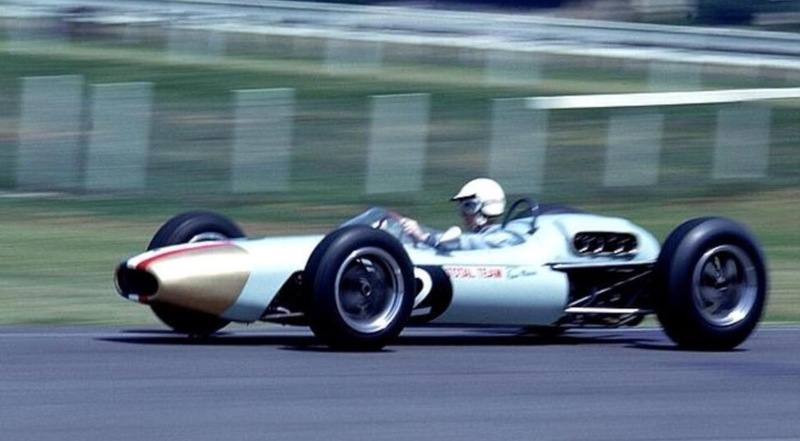 1962 was a shocker for him with Ferrari who had failed to develop the 156,1963 in an ATS was far worse and his drives for Cooper reflected the fact that design wise, their cars were becoming outdated. 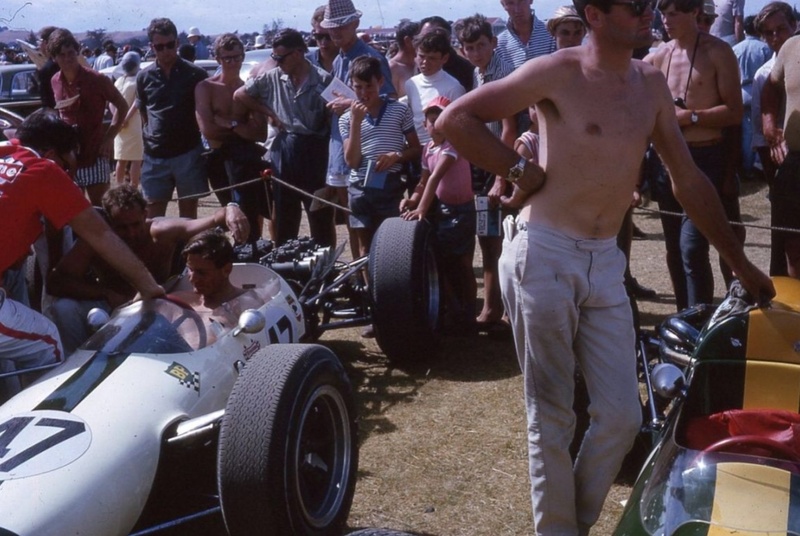 If there was any doubt about Hills single-seater speed, he proved he ‘cut the mustard’ aboard a competitive year old car in the ’65 Tasman. The Mayer/McLaren/Hill Cooper T70 Climax raced by all three drivers, originally carrying chassis plate ‘FL-1-64’, re-plated by McLaren prior to the ’65 Tasman to ‘FL-2-64’ passed through the hands of Bill Patterson for driver John McDonald, Don O’Sullivan and others before being acquired by Richard Berryman in 1974. The car was eventually beautifully restored by his son Adam in Melbourne, who retains and races it. 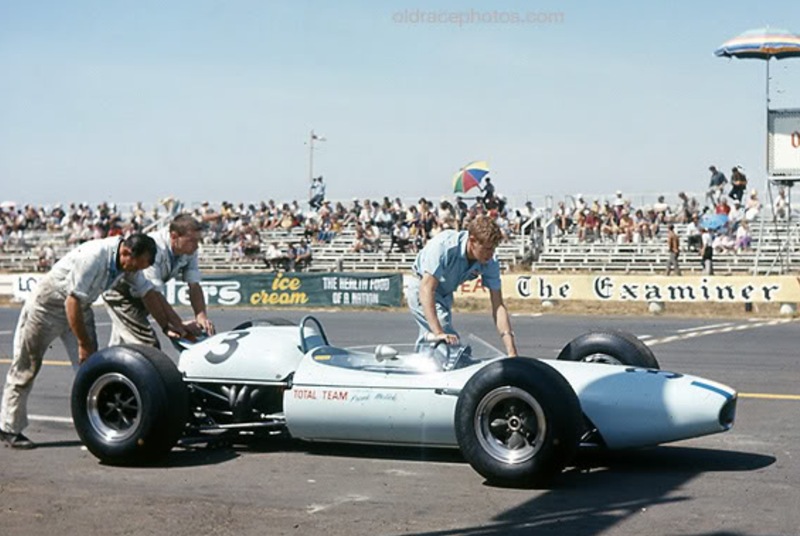 The T79 was sold after the Tasman to John Love in South Africa who won many races in it before it later returned to the UK, it too still exists. Levis with the 1.5 Brabham BT6 Ford was in the groove with a brilliant 51.1 sec, his time put all the 2.5 drivers to shame. 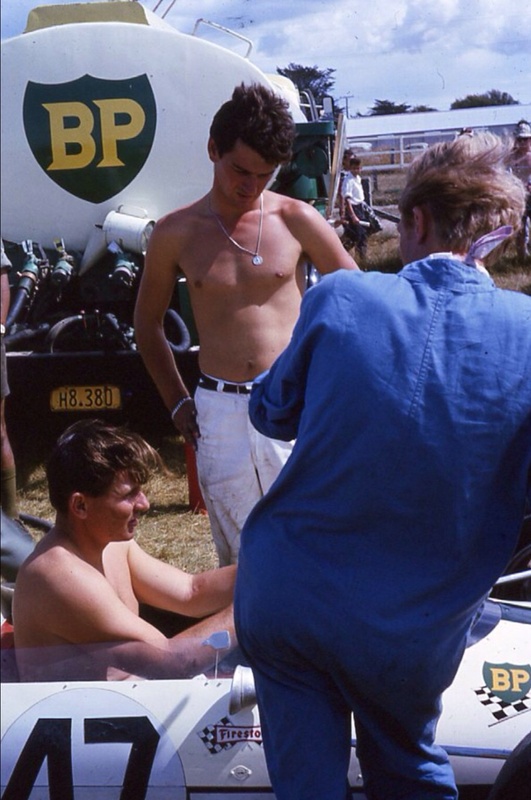 Palmer could only manage 51.7 sec in his Brabham BT7A, Grant 51.9 sec in his BT4, Abernethy did 52.2 in his Cooper T66 and Gardner was credited with 53.5 sec in Alec Mildren’s BT11A. Grant was a late arrival. His Brabham-Climax had undergone a major engine rebuild since the discovery of a cracked crankshaft on the eve of the Grand Prix. Second quickest 1.5 was Buchanan’s Brabham BT6 Ford with 52.0 sec. Qualifying times were academic in the sense that grid positions for the feature race were decided on heat results. 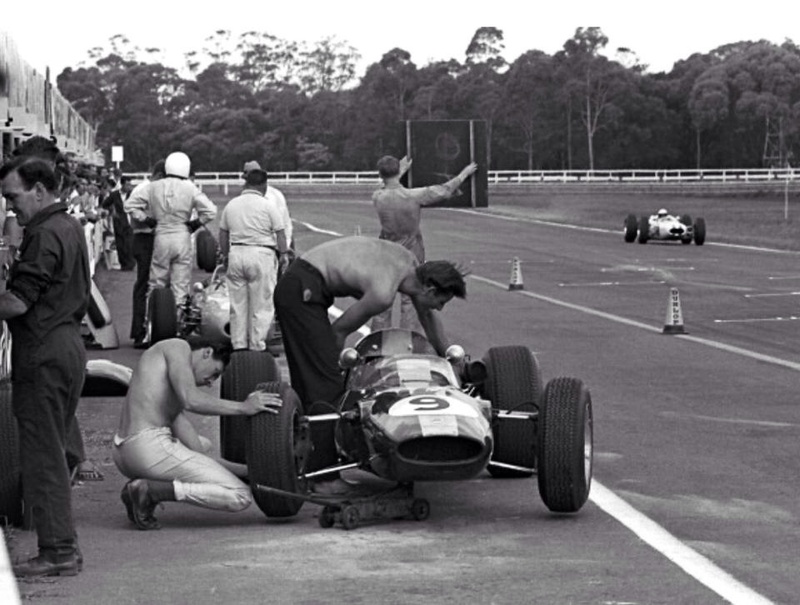 The eight-lap heat on raceday morning contained all overseas drivers and favoured locals. 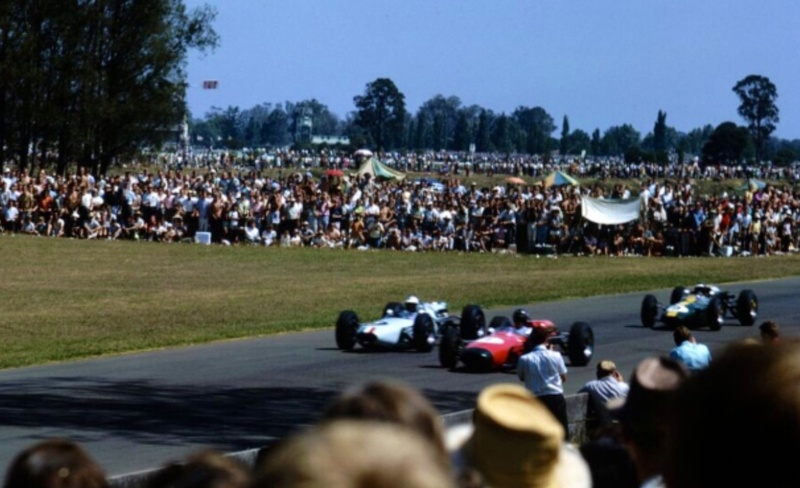 ‘Clark, sharing the front row with McLaren and Hill, jumped into the lead from the start and remained there to the finish. Hill, McLaren, Palmer and Grant settled into the next four spots after Gardner had dropped out with distributor trouble. The contest was enlivened a little by Palmer catching Grant napping on the seventh lap and assuming fourth place. Clark won in 6 min 49.8 sec and set a new lap record of 49.9 sec’ sergent.com reports. Levis had things all his own way in the second heat, winning in 7 min 13.5 sec, with Andy Buchanan, also in a 1.5 Brabham BT6 Ford, next. 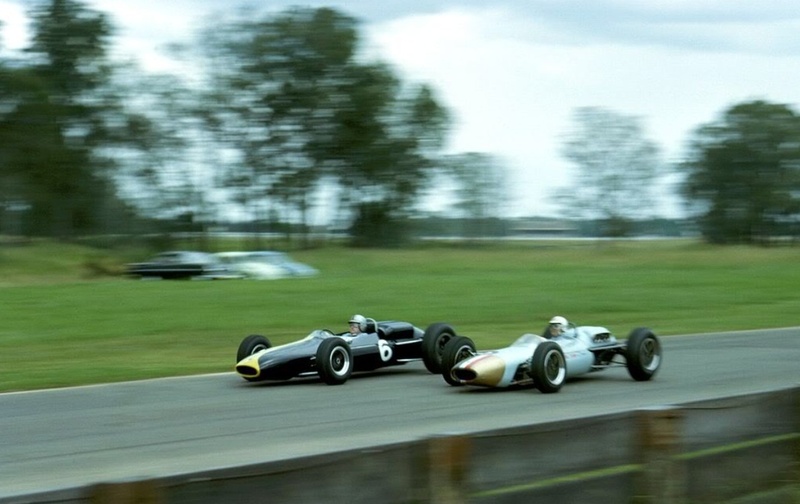 Third and fourth were Red Dawson Cooper T53 Climax 2.5 and John Riley in a Lotus 18/21 Climax 2.5. The situation was confused by Gardner who, anxious to make sure all was well with his car, was permitted to use the heat as a test run and took the lead in the last two laps. Before the title race there was some feverish work in the Palmer pit to replace a cracked universal joint in his Brabham BT7A Climax. In a drama filled day for the team, an hour before the race was due to start, another close inspection revealed a hairline crack in a half-shaft. A replacement was found and fitted minutes before the cars were gridded. Clark, Lotus 32B had pole position in the main event with Hill, Cooper T70 and McLaren, Cooper T79 outside him. 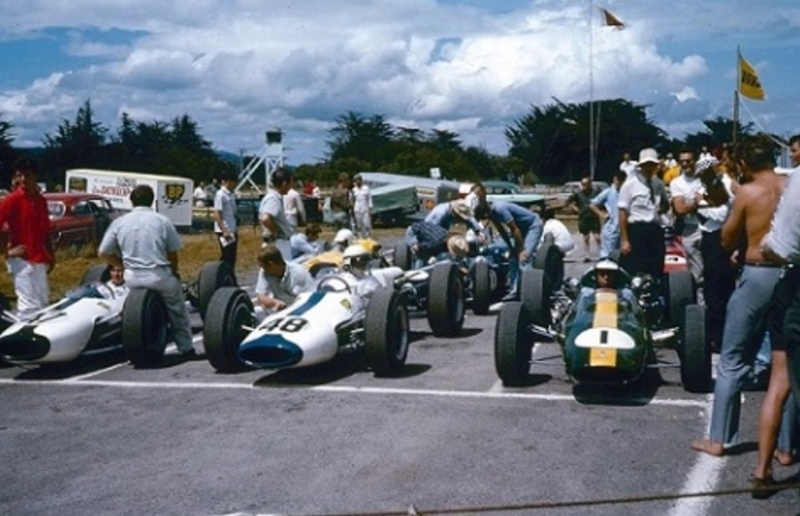 In rows of three, the rest of the field comprised Palmer, Brabham BT7A, Grant, Brabham BT4, Gardner, Brabham BT11A; Levis, Brabham BT6 Ford 1.5, Buchanan, Brabham BT6 Ford 1.5, Abernethy Cooper T66; Dawson, Cooper T53, Thomasen, Brabham BT4, Brabham BT4 Riley; Flowers, Lola Mk4A, Smith, Lotus 22 Ford 1.5 Lawrence, Brabham BT6 Ford 1.5; and at the back Hollier, Lotus 20B Ford 1.5. As the cars were forming on the grid, Abernethy could not select a gear and he had to abort the start’. A 51.6 sec second lap gave Clark a 3 sec lead over Grant. 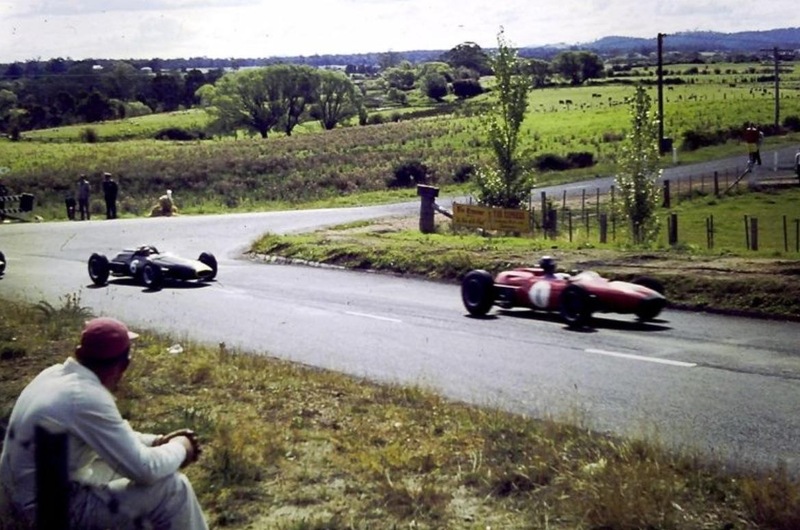 In his fourth lap Palmer took McLaren and in another two laps had moved to third place ahead of Hill. Clark held on to his lead over Grant. There was then a gap of 3 sec to Palmer, with Hill and Gardner next in line. 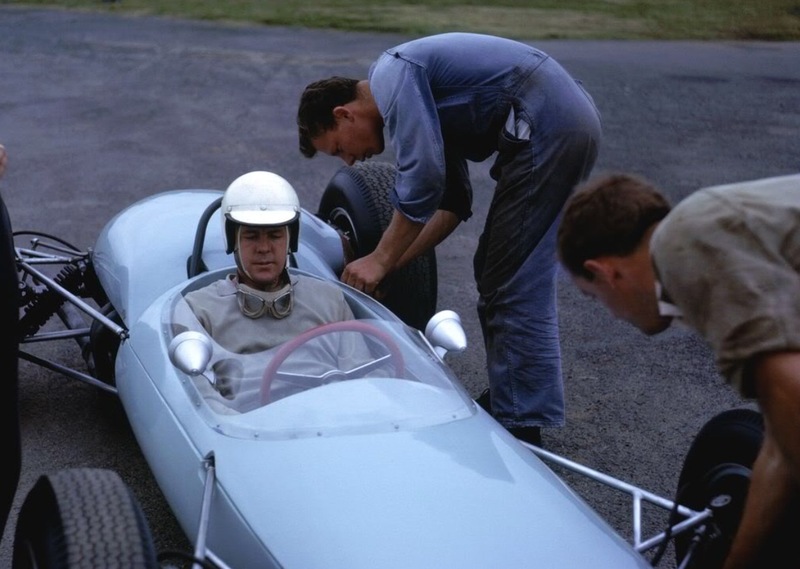 McLaren, probably to his embarrassment, had the 1.5 drivers Levis and Buchanan looming large in his mirrors. The pattern changed dramatically during the tenth lap. Grant tried to correct a slide at Cabbage-Tree Bend, dropped a rear wheel into the rough and spun off the course to lose all chance in such a short race. Palmer took second spot, but not for long. Gardner in the next three laps bridged the gap to take over second place just 5 sec behind Clark. Next in line were Hill, McLaren and Levis. Flowers was out with transmission failure in the troublesome Lola on lap 14. Those opening laps had been fast and furious. In their sixth lap Grant and Gardner had returned 50.6 sec in the midst of heavy traffic. A lap later Clark equaled his morning record of 49.9 sec.